Along with my colleague at Microsoft, David Gristwood I have been working on and off on an IOT reference architecture using data from the Microsoft Band. Dave focuses on the Azure side of things and I am traditionally a more client-side developer so we teamed up to create the Band on the Run project. More about that project at a later time but for now I just wanted to share some of the client-side code for developing a band app without connecting up a physical band. This has proven to be fairly useful for us as it has allowed us to generate band data without the need to ensure we had charged up our bands / left our bands somewhere else, etc. 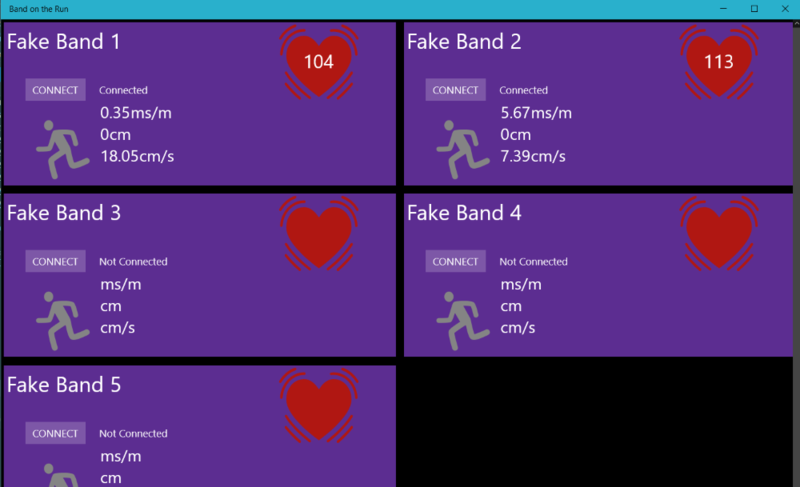 More importantly, it has allowed us to prototype an app which consumes data from more than one band easily. Why would ConnectBandAsync have a 1sec delay? Whats the use of that?! If I recall correctly I chose an arbitrary delay to simulate the async behaviour – does making that configurable work for you? I am starting to use the NuGet package mainly to simulate a Band 2 until I get hold of mine, and updating my existing app to be compatible with Band 2. I am only using the MeTile behavior currently. Seems in your code the dimensions of the MeTile are set to 310×102 even when setting the Band2 version´- this should be 310×128 for Band 2 I believe. Any chance of an update and new NuGet package reflecting the correct dimensions? Yes, could you submit an issue on the Github page?